The variation of Chihuahua coat colors is one of the things I love most about this breed. With all the interesting colors and combinations there are truly no two chihuahuas alike. 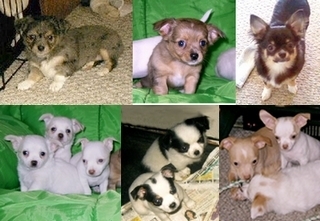 All the beautiful Chihuahua coat colors shown above are from litters from my Tipsy 2 Spot and Sir Rascal. I am always surprised and amazed at the variety of colors produced by this pair. According to AKC Standards, a chihuahua can be "any color - solid, marked or splashed". The main colors are Black, Chocolate, Fawn, White and Blue. Within each group of main color, there can be combinations of colors, markings and patterns, such as sable, brindle and masked. Marked means a solid color with a few markings or patterns on the face or body. Splashed means patches of colors on a white body. In the US, the black combination is a popular color group for chihuahuas. Black chihuahuas have dark eyes and a black nose. Gray and white hairs begin to show up on their face and body as they mature, especially around the muzzle, but this can happen as early as a year old. An advantage of having a black chihuahua is that they will not show tear stains. Totally black chihuahua coat colors usually don't do well in dog shows, it's harder for judges to see their features and expression, the same holds true for trying to photograph them. It takes really good light to capture their very expressive eyes. BLACK AND TAN - Very much like the markings of a Doberman. The chihuahua is mostly black with black patches above the eyes, on the cheeks, around the muzzle, chest and legs. BLACK AND TAN WITH WHITE MARKINGS - This is called a black tricolor, very pretty. BLACK AND WHITE - This is mostly black with white on the chest, face, and/or legs. BLACK SPOTS ON WHITE - This is a mostly white chihuahua coat color with splashes of black on the body and/or face. Chocolate is the term used for brown chihuahuas. "Brown" chihuahuas can be in the chocolate group or the fawn group. Fawn is really more like tan, cream or gold. The chocolate gene blocks the black pigment in the nose and toenails. So if you see a "brown" chihuahua that has a black nose or toenails, it should be called fawn and not chocolate. CHOCOLATE AND TAN - Mostly chocolate with tan markings above the eyes, around the muzzle and cheeks and on the chest and legs. CHOCOLATE AND TAN WITH WHITE MARKINGS - The chocolate tricolor combination, has the same markings and patterns as above, with white on the face, chest, legs and tail. CHOCOLATE AND WHITE - Mostly chocolate with white markings. If tan or fawn are mixed in, then it is a tricolor. CHOCOLATE SPOTS ON WHITE - A mostly white chihuahua with chocolate splashes on the body. Solid white Chihuahuas coat colors are rare, usually they have markings of other colors on their body. The colors of the markings may be fawn, cream, gold or red. White chihuahuas can have black noses and toenails or a lighter color such as beige or pink. Most people are very confused by this term. Blue is actually the official term for gray, it can range from silver to dark steel. Pure blue dogs, not only chihuahuas, are commonly associated with a serious condition known as alopecia (balding). There is not much you can do about it medically. Feeding a high-quality diet with essential fatty acids may help. Not all blue chihuahuas get alopecia especially if it's a blue combination, the BLUE AND WHITE WITH TAN tricolor combination is especially beautiful.